This is a report highlighting activities being carried out by the development department in a particular project called SILC (Savings and Internal Lending Communities). 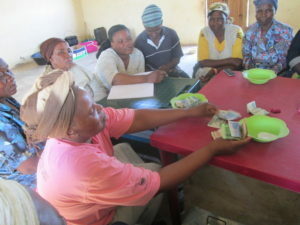 The Swaziland Integrated Livelihoods Project under the Food Security Program implements many developmental projects, but the scope of this report only focuses on the SILC project and on interventions particular to the Lubombo and Lower Shiselweni Region. SILC is a Savings and Lending scheme that is being spearheaded by the Food Security Program in partnership with the Catholic Relief Services. SILC is a community led savings or microfinance scheme that can be practiced even by the poor of the poorest, the loan repayment terms are set to minimal rates and the amounts to be saved are also set to levels affordable by everyone .The two organizations partnered up in the year 2012 so as to deliver sustainable development in Caritas Swaziland through mobilizing the communities to form savings groups. By May 2012 the SILC Project recruited 6 Field Agents to directly execute SILC activities. In the month of June 2012 the Field Agents with the SILC Coordinator conducted sensitization meeting among the two regions of Swaziland Lubombo and Lower Shiselweni region By then four were involved with the project parishes that’s Good Shepherd, St Constantine,St Phillips and Our Lady of Sorrows . From the four parishes we are now working with 3 parishes actively engaged in SILC. SILC aims at enriching the lives of those people who have been left out of the formal financial grid; it is for members of the society who do not have access to financial services provided by banks and other financial institutions. This means that the methodology seeks to deliver financial services to the poor not by dragging them into urban areas to find financial services which are rather costly, but deliver to their doorstep financial services they can afford and enjoy at absolutely no or less costs.